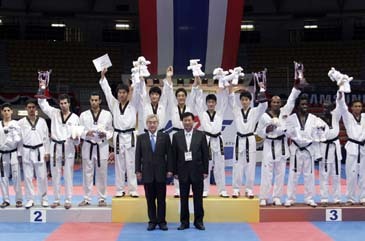 BANGKOK, Thailand — The 1st WTF World Cup Taekwondo Team Championships wrapped up its five-day event here on Sept. 18, 2006, in a great success for good reasons. The Championships, which took place at the Hua Mark Indoor Stadium, were regarded as one of the best organized taekwondo events, with the least protests during the competitions. The Fair Play Award and the Best Coach Award were newly created. In the overall medal tally, Korea clinched both male and female titles in the individual and team competitions of the championships. "This championship was by far one of the best organized championships we have ever had." said Dr. Chungwon Choue, president of the World Taekwondo Federation, in his prepared speech text handed out to local journalists on the final day of the championships. Dr. Choue especially thanked the organizer of the event, the Taekwondo Association of Thailand, for such an excellent organization of the championships. During the closing ceremony, WTF President Choue honored five international referees for their efforts to ensure fair judgment and refereeing at the World Cup Championships. The recipients of the Best Referee Award were Jessica B. Stenholm of Norway, Khim Hua Seng of Australia, Sin Dong Jun of Japan, Sheyka Vladimir Iva of Russia, and Tung Ya Ling of Chinese Taipei..
WTF President Choue also said, "To the athletes, you have treated us to some spectacular matches. Every sweat, every injury is evident of your total commitment to our sport." "I am especially heartened to witness the final of the male middleweight division between the athlete from Iran and the athlete from Italy. The unyielding spirit and fair play mentality of both athletes epitomize the beauty of our sport." In this regard, Dr. Choue presented the newly established Fair Play Award to the Italian team during the ceremony. In the final match of the male middleweight category of the individual competition of the championships on Sept. 14, the Italian athlete, Mauro Sarmientio, was in obvious pain from his injuries sustained in earlier bouts and his movements severely hindered. Nonetheless, he fought on and completed the match against Iranian Mehdi Bibak Asi. At the end of the match, both contestants embraced warmly in true fair play spirit. "What I am especially pleased to see is the diversity in the winners. Thailand has emerged as a force to be reckoned with, along with other up-and-coming power houses in the sport," Dr. Choue said. "Such competition will lead our sport to greater heights." Among the 35 participating countries in the championships, 19 countries won at least one medal. In the individual competition of the World Cup on Sept. 14-17, Korea won seven gold medals, two silver medals and four bronze medals overall, followed by Spain with two golds, two silvers and three bronzes. In the overall medal tally, host Thailand came third with two golds, one silver and three bronzes, followed by Iran with two golds, one silver and one bronze. Australia ranked fifth with one gold and two silvers, with Russia winning one gold and one bronze. Norway earned one gold, with Italy grabbing three silvers. In the one-day team competition of the World Cup Championships on Sept. 18, Korea won both male and female team titles. In the female division, Turkey stood at second place, with China finishing third. In the male division, Iran came second and France third. WTF President Choue also mentioned the spectators in his remarks. "To the spectators, I am extremely glad to be part of the championships. Every day, the atmosphere and support from the fans are electrifying. The citizens of Thailand have embraced us with open arms." During the championships, a Samsung booth was set up at the entrance of the competition area. Samsung, the global partner of the WTF, sponsored the championships. "Finally, I wish to extend my congratulations to the citizens of Thailand for the 60th anniversary of the accession to the throne of His Majesty, King Bhumibol," Dr. Choue said. During the closing ceremony, the Best Player awards were presented to Korea's Chang-ha Jang in the male division, and Thailand's Yaowapa Boorapholchai in the female division. The Best Coach awards were given to Thailand's Young-seok Choi in the male category and Korea's Sun-mi Park in the female division. The Good Fighting Spirit awards were delivered to five countries: Egypt (Africa), Turkey (Europe), the United States (Pan America), China and Chinese Taipei (Asia). The Good Fighting Spirit awards are given to teams that, although lacking in gold medals, participate with the most desirable spirit and attitude. The award is given to one member national association per continent, as a form of encouragement and recognition of the courageous efforts of the teams. There are two nations from Asia, as Australia was the only representative from Oceania and had already won the gold medal. The WTF's ad-hoc Evaluation Committee recommended the creation of a new award – Fair Play Award for Athletes and Good Fighting Spirit Award for Athletes. The committee said it believes that the new awards would be a good incentive to encourage athletes to propagate the true spirit of fair play through the sport of taekwondo.